There will be a public forum on Racial Equity and the Criminal Justice System on Tuesday October 17, 10 a.m. – 3 p.m. — in the Jones Commons in the Lindquist Center on the UI campus. Sponsored by the Iowa City Human Rights Commission, the UI Center for Human Rights and other groups. Watch for more details to come soon and come and participate! Meeting: Thursday, September 12, Noon – 1:30, First Baptist Church, 500 N. Clinton St. Here are the details for our next meeting. All are welcome. We look forward to seeing you there! Please refer to the map below if you’re unfamiliar with Iowa City. In August of 2013, we completed the Racial Equity Survey report of School Board Candidates. Each candidate was asked the following four questions. Click here for the full report in PDF format. Please describe the similarities and differences you have observed or know about between experiences children of different races or ethnic origins have in the Iowa City Community School District? ￼What are 3 priority actions the school district and the school board should take to ensure that children of different races and ethnic origins enjoy the same educational opportunities and are treated and disciplined equitably? The data from the 2011-2012 report indicates 33% of the enrolled students in the ICCSD are children of color, and yet 94% of the employees are white. If you believe this needs to change, what do you propose the school district do to recruit, hire, and retain persons of color to fill teaching, staff and administrative positions? Why should people who are committed to racial justice support your candidacy specifically? Calls against local and national racial profiling, continued inadequacy in the American education system, socioeconomic disparities, and civil-rights movement remembrance were pushed to the forefront of Iowa City’s Pedestrian Mall on Wednesday evening. And while the topics of discussions varied, they all eventually tied into one prominent national verdict and the death of a single Florida teenager. The “Moment of Mourning” vigil honored Trayvon Martin, a 17-year-old unarmed African American who, while walking home from a Sanford, Fla., convenience store, was shot and killed on Feb. 26, 2012, by neighborhood volunteer George Zimmerman. On July 13, a Florida jury found Zimmerman not guilty in the teenager’s death. But for Coralville resident Francine Thompson, the verdict, and Wednesday’s gathering stands for a national catalyst for change that she says has been building for decades. The Iowa City area, she said, is not immune. Joining a crowd of nearly 200 who descended on the downtown Weatherdance Fountain Stage, Thompson’s story resembled those of the nearly dozen speakers. As topics of discussion spawned from the Zimmerman verdict, many drew from the common theme of community, regardless of race, ethnicity, sexual orientation, or religious affiliations. Several speakers, poets, and singers referenced the work of civil-rights movement icons Martin Luther King Jr. and Malcolm X in pushing away from the discriminatory envelope, while defying Florida’s stand-your-ground law. Tate High student Emeral Green, originally a resident of Chicago, said she was asked several days ago if she considered herself safe in Iowa City. She said she had to pause and collect her full thoughts before giving a response. Feeling a lack of educational support in school at times, coupled with continued second looks by teachers and police officers that she said is tied to her African American heritage, her answer is mixed. “A change has to come, and hopefully, hearing from young teens, we can spread teenage advocacy,” she said. To LaTasha Massey, a co-head of the Iowa City/Johnson County Coalition for Racial Justice, the conversation calls upon a systemic set of generations who have endured discrimination. A piece of the solution, she said, starts with familiarizing oneself with others to effectively break down discriminatory barriers. “If we care about our neighbors, then they’ll care about theirs, and it’ll spill over,” she said. “Change might not be in my generation, but we have to have consistency. “Not in my city, not in my name, not in my block, not next door,” she said. He deferred comments to Sgt. Vicki Lalla, who was unavailable for comment as of Wednesday evening. Anthony Haughton, said supporting the Dream Center, a volunteer-driven nonprofit organization that provides social and educational programming to families, with a focus on empowering and educating fathers and young men, is among the first steps necessary. Haughton, whose mother was the first registered African American nurse at the University of Iowa Hospitals and Clinics, stressed the need for educational mentoring. “If you don’t stand for something, you’ll fall for anything,” he said. A new report by a Johnson County task force titled “Racial Equity in Iowa City and Johnson County” had some very disappointing findings. While Johnson County may rightly boast of being a vibrant community that offers a high quality of life, there are still significant and troubling racial disparities that exist in our community in education, juvenile justice, adult criminal justice, economic well-being, housing, and representation in community leadership. The report reveals that children and adults in the greater Iowa City area experience different opportunities and quality of life depending on the color of their skin or ethnic background. The existing disparity is deplorable because it unjustly limits opportunities for minorities. Therefore, we, as a community, should hasten to face the challenges and devise strategies in order to achieve racial equity. The K-12 student population is more diverse than is the community at large, with minority enrollment of approximately 33 percent in 2012–13. However, statewide data show significant racial disparities in academic achievement, with African-American and Latino students graduating at lower rates than white and Asian-American students. There are also far more African-American and Latino students facing suspensions and police referrals and in special-education programs compared with Asian and white students. In order to ensure that African-American and Latino students are graduating at higher rates and not experiencing the lifelong disadvantages associated with not graduating, the report suggests that citizens of Johnson County encourage the Iowa City School District to continue and strengthen its efforts to address racial disparities in K-12 education. Associated with low graduation rates and criminal recidivism, there is juvenile detention. In one national study, only 12 percent of those who had served time in a juvenile-detention center went on to graduate from high school or earn a GED. Black and Latino youths in Johnson County are arrested and detained at considerably higher rates than white youths. In fact, Johnson County led the state in the racial disparity of juvenile arrests, with black youths being nine times more likely to be arrested than their white counterparts. To address the disparity in juvenile detention, the report suggests community input into law-enforcement practices, policies, and programs through community policing and accessible complaint procedures. Johnson County is no exception to the national phenomenon of racial disparities in adult criminal justice, either. African-American residents make up 4.8 percent of Iowa City’s population but accounted for 28 percent of non-traffic arrests by Iowa City police in 2011, and black inmates made up 42 percent of the Johnson County Jail’s average daily population in 2010. While blacks and Latinos are overrepresented in prison populations, they are significantly underrepresented in policing. Black and Latino officers together made up only 6 percent of Iowa City’s police force in 2011. The report stresses the importance of availability of reliable data to monitor racial disparities. To do so, the report suggests establishing uniform data collection and reporting on race and ethnicity for Johnson County’s several law-enforcement agencies. Easy public access to data on law-enforcement contacts, traffic stops, arrests, and incarceration in Johnson County is also recommended. As for economic well-being, only 16 percent of white households in Johnson County have poverty-level incomes compared with about 40 percent of African American and 26 percent of Asian families. Johnson County’s black, Latino, and multiracial residents also experience significantly higher unemployment than people of other ethnicities. Identifying the barriers to people of color in income and employment is important in addressing the situation. It is clear that significant disparities exist in Johnson County, and reversing these trends will require major changes to the county’s public institutions. Such changes will depend not only on policy changes but also on an increase in racial and ethnic diversity among elected leaders and in public institutions. The county and its residents alike must act to improve equality. 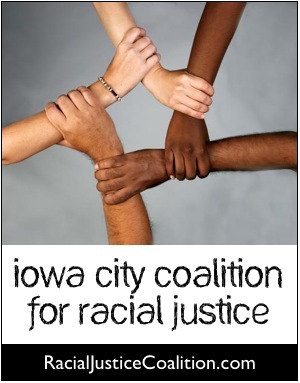 Meeting: Thursday, August 8, Noon – 1:30, First Baptist Church, 500 N. Clinton St.
IOWA CITY, Iowa- Iowa City and all of Johnson County may have a reputation as one of Iowa’s most racially-diverse areas. But a report out Tuesday from a community group says there are troubling signs of inequality and disparity that could mar that reputation. The Coalition for Racial Justice produced the study of statistics and trends in Johnson County when it comes to minorities. The report noted that the population of minorities has risen from the 11% in the 2000 Census to 17% in the 2010 Census. One disparity example concerned unemployment. The report entitled “Racial Equity in Iowa City and Johnson County” noted that blacks had an unemployment rate of 12.1% in 2011. For Latinos it was 5.9%. The overall unemployment rate during that same period for the county as a whole was 4.3%. Coalition members admitted many of the figures in the report have come out before. But the idea was to put it together in one place to enable the whole community to focus on the issues. One report author, Diane Finnerty, said many in the area are proud of the diversity and progressive nature of Johnson County. And they might not recognize there is an issue of racial justice. “I think as a white person I’ve very progressive about many social issues. But I still have a great many blind spots on racial issues,” Finnerty said. The 18-page report found students of different races don’t graduate from schools at the same rate. Black students are overrepresented when it comes to getting singled out for school discipline. Black juveniles are also six times more likely to be arrested by police compared to white teens. LaTasha Massey, another report author, said it’s difficult to look at some of the numbers an insist there isn’t an issue of race in Johnson County. “We are, in fact, a tale of two cities in which residents fare very differently depending on race and ethnicity,” Massey said. The report did not offer reasons for the racial differences in those statistics and the ones showing both blacks and Latinos also do worse in issues of housing and business ownership. But they did offer one first step–calling for a racial justice roundtable in the county to begin examining the reasons for disparity and ways to combat the problem. The Equity Report was presented on July 23 at the Iowa City Public Library from 2:00 PM to 3:00 PM in Meeting Room A. [event] A summary is provided below. The Coalition for Racial Justice developed a report stating that significant and troubling racial disparities exist in our community in education, juvenile justice, adult criminal justice, economic well-being, housing, and representation in community leadership. The report reveals that children and adults in the greater Iowa City area experience different opportunities and quality of life depending on the color of their skin or ethnic background. The Report presents data, broken down by race/ethnicity, on education, juvenile justice, adult criminal justice, economic well-being, housing, and representation in community leadership. To create the Report, we gathered existing data from multiple sources to take a statistical snapshot of families and youth in our community. These areas were chosen because of their importance in shaping individuals’ opportunities and well-being. The Coalition for Racial Justice is committed to shifting the local conversation towards an understanding of racial equity. The Minneapolis Foundation defines racial equity as a condition where “race and ethnicity no longer adversely shape an individual’s or group’s experience with power, access to opportunity, treatment and outcomes.” A Racial Equity approach uses data to assess how different groups are faring in a community and to evaluate the success of programs designed to improve those conditions. Several community models exist for improving racial equity. Seattle’s Race and Social Justice Initiative is one model that seeks “to end institutional racism and race-based disparities in City government.” Members of the Coalition for Racial Justice are available to provide information about the models and tools that have been developed and to facilitate discussions about conducting racial equity impact assessments in our community. We hope the Report fosters dialogue among residents, elected leaders and other local officials, and community organizations. Our goal is for people of all races and from all sectors to work together to create a community that is a model for achieving racial equity and inclusion. A Racial Justice Roundtable composed of people of diverse backgrounds and from key sectors should be convened to provide leadership on using a racial equity lens to addressing racial disparities in our community. Racial Equity Impact Assessment tools should be used to assess programs, policies, practices and budgets, and formulate concrete strategies to eliminate any inequities based on race or ethnic background in public policy and organizational practices. Leadership by people of color should be honored and built upon to increase the civic participation in public commissions, boards, and meetings. Local funding opportunities, community awards, and leadership development opportunities should be available for organizations led by people of color. Additional questions are raised in the report for each area discussed. Issues of racial disparities won’t resolve themselves without intentional efforts; if left unresolved, the disparities will continue to grow given the changing demographics. Johnson County is becoming more racially and ethnically diverse. The 2010 Census found that 17 percent of Johnson County’s population was comprised of people of color, up from 11 percent in 2000. Coralville is the most racially diverse municipality: 23.5 percent of Coralville residents were people of color in 2010, compared with 14.6 percent in 2000. People of color comprised 20.3 percent of Iowa City residents in 2010, compared with 14.2 percent in 2000. And 12 percent of North Liberty’s population were people of color in 2010, compared with 5.9 percent in 2000. In June 2010, the Consultation of Religious Communities (CRC) of Johnson County established a community task force on Race, Poverty and Public Safety in response to numerous reports received by its affiliated religious leaders about problems faced by African Americans in Iowa City. The group reorganized in Spring 2012 and changed its name to The Coalition for Racial Justice to serve as a broader community coalition. The Coalition is committed to joining together to promote racial justice through action, education and empowerment. The Coalition has organized several actions toward achieving racial equity since its inception, including co- sponsoring the “Iowa City Million Hoodie March” on March 26, 2012.